When most people imagine life without clean water, they think of places like Sub-Saharan Africa or South Asia - communities that barely resemble their own. But at last count, an estimated 1.7 million Americans live without clean, running water at home. The recent drought has only exacerbated the problem. In the past year, an estimated 5000 Californians have lost water access due over-extraction from local aquifers and a falling water table. American families without clean water live lives totally different from our own. They often wake up and collect water from a source outside their home, fetching it in buckets and boiling it on the stove. When desperate, many collect water from unsafe sources contaminated with bacteria, nitrites, arsenic or even uranium. Water poverty is especially rampant on Native reservations. More than 13% of Natives don't have reliable access to water. Compare that number to just .04% of non-Native Americans. 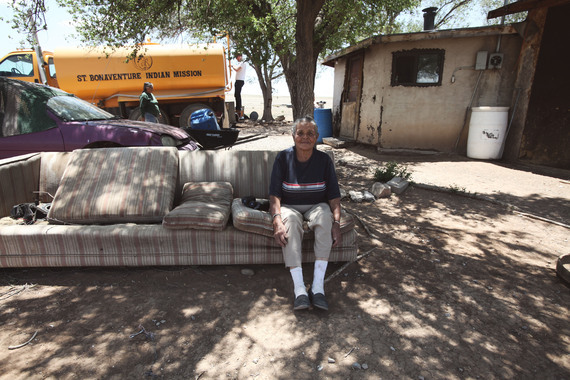 The photo story below is from the Navajo Reservation, the country's largest in the Southwest. There, more than 40% of people don't have a tap or a toilet, and DIGDEEP is the only global water organization working to build local infrastructure. We often think of water as a matter of "haves" and "have-nots" - most families have reliable water access, some do not. But there's another way to consider this situation: most American families take water completely for granted, some do not. During this epic drought, we can turn to our neighbors to learn valuable lessons about the importance of water and the lengths we should go to conserve it. 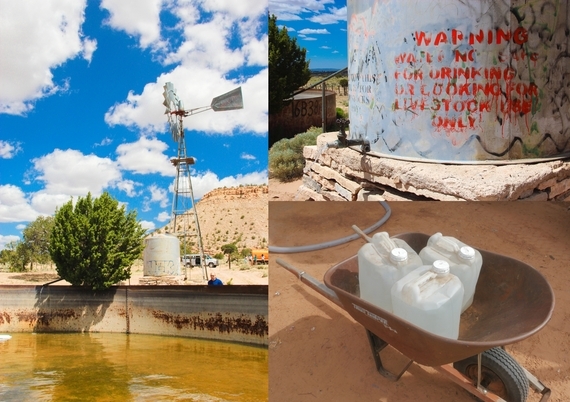 In the high desert of the Navajo Nation near Smith Lake, New Mexico, clean water delivery happens once a month. Darlene, 'the Water Lady' drives a 3,000 gallon truck five days a week, delivering water to more than 250 homes up to 70 miles apart. The families on her route only get about 400 gallons of water a month on average...that's about seven gallons per person, per day. Most Americans use more than 100 gallons a day. When families run out of water - as most do by the middle of the month - they have two choices: haul water for free from an unsafe source, or pay a high price to fill their buckets from taps far away. A 2006 study estimated that Native families hauling water pay 72 times more for the same water than families hooked up to local utilities. About 40% of people here don't have a tap or a toilet at home. Those that can't afford to pay for water walk to non-potable sources like livestock tanks and windmills. Even when the water seems clean, it probably isn't. For months, the Martinez family (pictured here) has been drinking water from a livestock tank a mile from their home. The water has no smell, but stains their clothes and makes their coffee taste bad. Worst of all - bacteria in the water makes them sick about once a month with food poisoning-like symptoms. Loretta Garcia, a Navajo elder, greets the water truck from the shade of her yard. 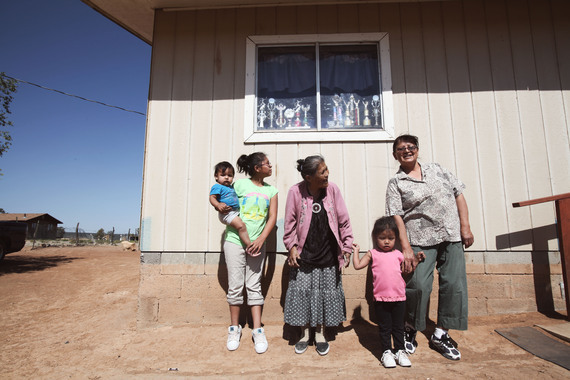 Only 58% of Navajo live on the reservation. Many elders live without the support of family, and without access to basic services like clean water. Without electricity or running water, many die of preventable disease or exposure to the elements. Many Navajo - or Diné - live in traditional homes like this one, called Hogons. This Hogon doesn't have electricity and water is kept in barrels next to the outhouse. In the winter, water barrels are rolled inside to keep them from freezing. Water makes everything else possible. Brenda Johnson poses for a picture with her mother, Lindsey, and her two nieces. When water was delivered on this day in 2013 Brenda immediately filled an empty pickle jar and brought it inside to cook tamales. She packed a cooler and walked several miles into town to sell the tamales, making enough money to buy a few gallons of gas to carry back with her. Then she drove two hours to Albuquerque to pick up her husband who had been discharged from the hospital weeks before but was stranded without a ride. Navajo Families know how to make water 'stretch' better than anyone. Nearly every home here has a makeshift bathroom like this one. After water is used for shaving or washing hair, soap is added and the same water is used to wash dishes. Finally, it's used to clean the latrine or flush the toilet (if the home has one). Things are steadily improving. Darlene, 'The Water Lady,' has been working with DIGDEEP (link to: digdeep.org/Navajo) - an LA-based water organization - to plan a new well and treatment facility in the middle of local homes. Several months ago, DIGDEEP provided a second water truck. Now they're installing plumbing in local homes while they wait for construction to being on a new, 2000 foot well. Soon, Darlene and the families she serve will have clean running water year 'round!